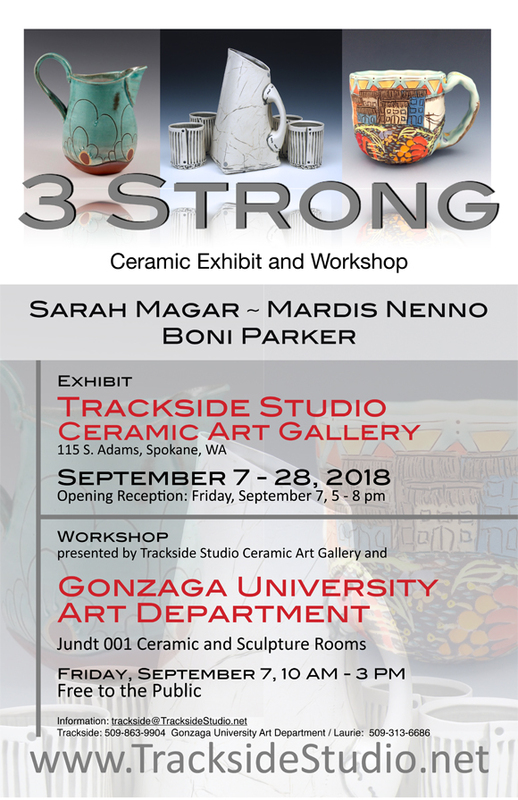 In conjunction with the “3 Strong” exhibit being held at Trackside Studio Ceramic Art Gallery for the month of September, Sarah Magar, Mardis Nenno and Boni Parker will be presenting a workshop in the ceramic / sculpture studios, Jundt Room 100, Gonzaga University Art Department. 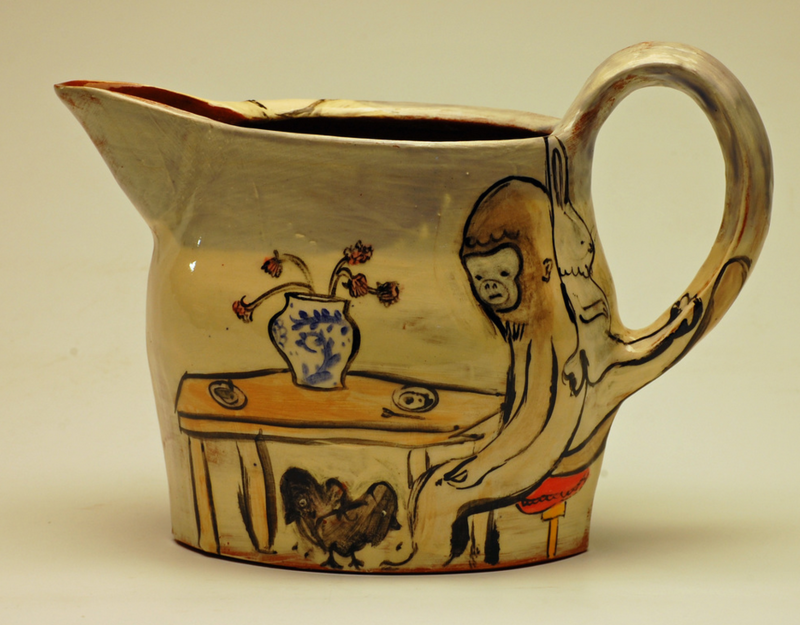 Magar, Nenno and Parker are functional potters but with different approaches, all three with whimsy and artistic character. Demonstrations will go on in tandem offering construction process and philosophical approaches to their work and studio regimens. Workshop is free to the public, runs from 10 AM - 3 PM. Reception for opening of exhibit follows at Trackside Studio, 115 S. Adams from 5 - 8 PM. $30. for adult$10. for student with ID Purchase workshop by clicking here! 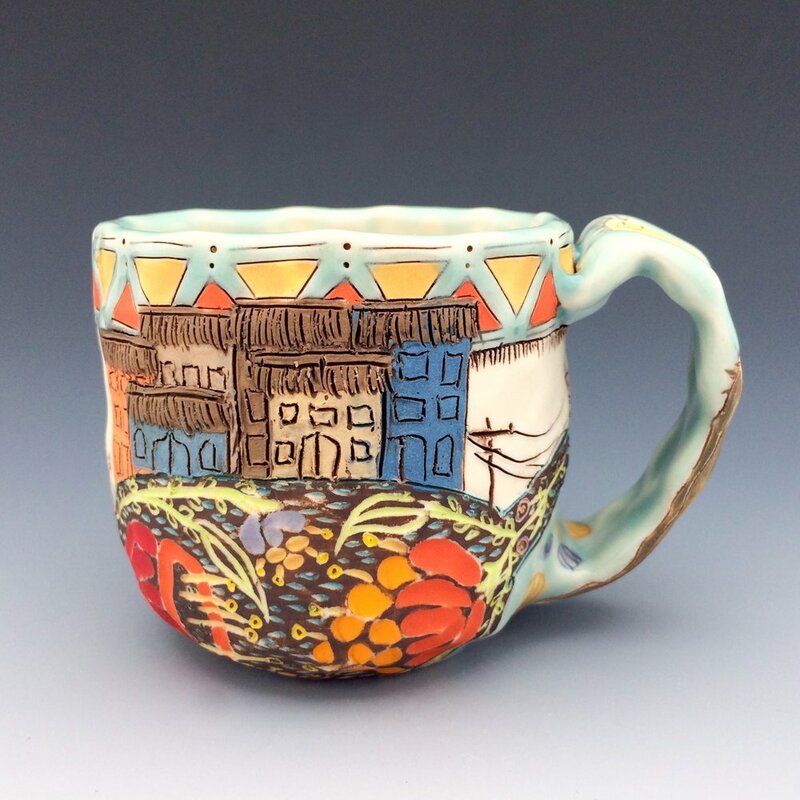 Trackside Studio is honored to feature the ceramic works of Loren Lukens for the month of September. His exhibit opens Friday, August 25th from 5 - 8 pm, also, First Friday of September, the 1st from 5 - 8 pm, continuing through this workshop, September 23rd. Loren has been a life long resident of Seattle, Washington, maintaining a full time studio and gallery for over 40 years. 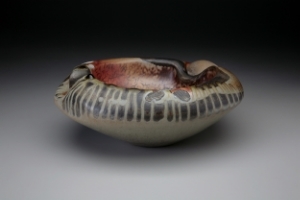 He built a professional career with his pottery that was represented across the United States through wholesale and retail festivals and fine gallery representation. WORKSHOP will cover throwing, trimming, altering, slip casting, hand building, art squeezing, glaze spraying. Discussion of work posture, studio management, business practices and ruminations from over 45 years in the biz. I discovered clay and pottery making as an art student in the 1970’s and it was love at first sight. It has been my passion and livelihood for more than 40 years. Brace Point Pottery is the studio/gallery and home in beautiful downtown Arbor Heights, West Seattle, that I have shared with my wife, Beth Kirchhoff (pianist, opera coach and conductor), since 1998. The beginnings of humankind go hand in hand with the beginnings of pottery. Of contemporary craft media, only basket making is as fundamental. 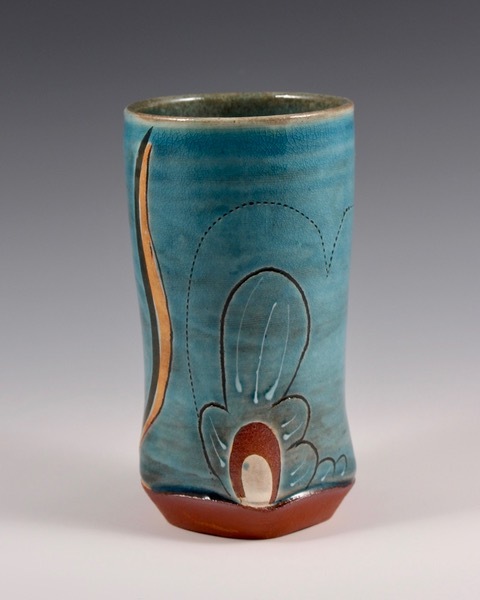 The shapes of pottery are the shapes of the human body, and are named such: lip, foot, shoulder. They are shapes we know very well on a level beneath our consciousness. My intent is to apply contemporary interpretation to traditional form and purpose by creating objects for people to use and enjoy. As an art student, Form and Function drew me to pottery, but painting has been an increasingly important aspect to my work. My best pots resolve the difficulty of painting in three dimensions, while maintaining the integrity of the form. Demonstrations by Ryan LaBar and Donna Flanery. 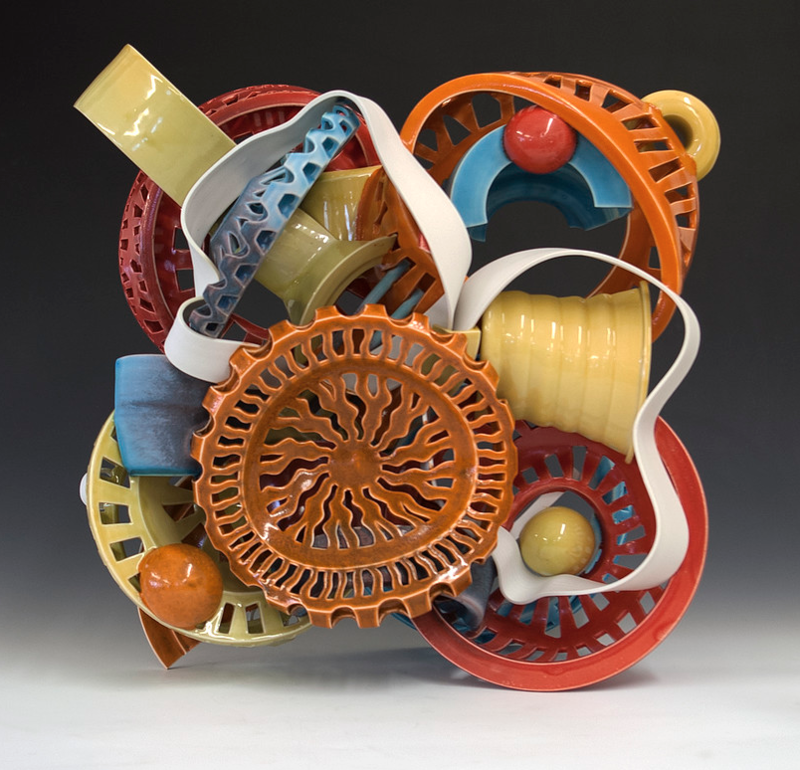 Join us as founding president, Ellen Krehbiel, Ikebana International Spokane Chapter #230, demonstrates the art of Ikebana, using the various ceramic forms we have on exhibit at Trackside Studio Ceramic Art Gallery. Ellen is the founding President of Spokane's local Ikebana chapter, one of three Ikebana Sensei living in Spokane and is an instructor of Ikebana at the Japanese Cultural Center, Mukogawa. 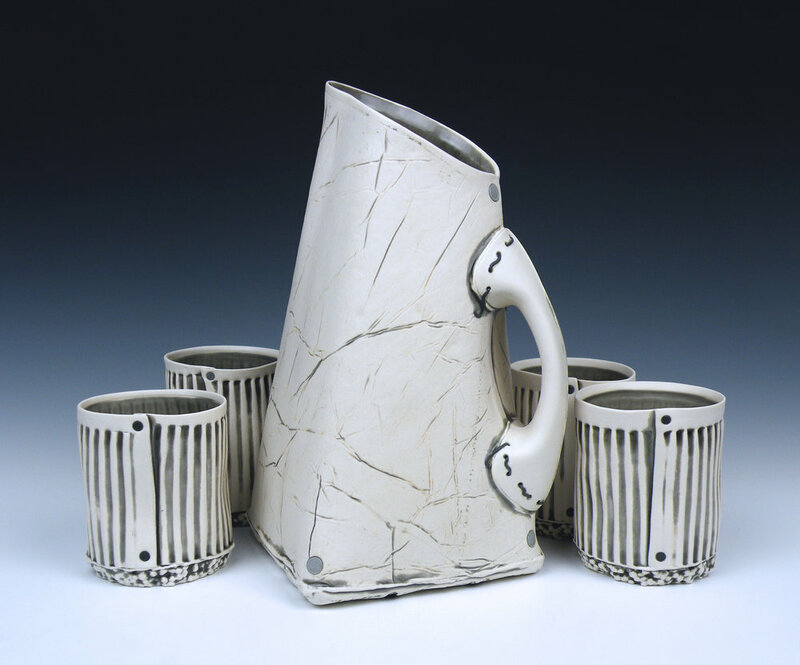 10% off any ceramic sales including the Robison / Guss exhibit for those in attendance. Workshop Location: Gonzaga University, Jundt Art Building, Ceramics classrooms on basement level. This is a quote from a recent workshop Reid gave in Honolulu, Hawaii. "Often, as potters, we become so enamored with the wheel and focused on its competent use, that we can lose sight of the possibilities. Conventional thinking about the potter’s wheel can be very limiting. Reid will present the concept of the wheel as a tool and not an end in itself. Once you see beyond the simple profile and height of the traditional use of the wheel, the potential for creating unique forms becomes apparent." Techniques will be presented giving participants a novel way to think about the wheel. Reid will discuss the parameters that need to be addressed in the throwing process when making forms for altering and the development and creation of the tools he uses to alter his work.